Last time we visited the library we picked up a few Chinese New Year books, and Munchkin has really enjoyed reading them. She’s been asking questions about the different animal years and customs, so I thought we would have a week of Chinese New Year themed trays. I also figured we must finally be on letter z week at school…but it’s letter v week. Ok – so Munchkin can’t use chopsticks yet, but she loves these training chopsticks we have. I provided two small Mason jam jars, one with yellow and red pom-poms, for her to transfer. She did managed to transfer some of the bigger ones, but she also poured back and forth too. Even though Munchkin is getting bigger (ha! 3.5) and has been doing these jobs for a long time, they are still important to include because Munchkin still finds them fun, and they are good for her hand strength, confidence, and dexterity. Also, she can’t actually use chopsticks yet, so this is a very appropriate task for her. I had some rice I’d previously dyed red, and a Chinese soup spoon, so I provided the same type of Mason jam jars for spooning work. The spoon is big, but the jars are small which provided a bit of a challenge. I saw Munchkin carrying this tray about a few times this week. We really haven’t ever done any measuring. Munchkin saw me use a tape measure a couple of weeks ago, and wanted to measure things too, so when I found Every Star is Different’s Chinese New Year pack, with measuring, this seemed like a great task for her! I didn’t print out the 7 inch dragon, only ones that can be measured by a 6in ruler. We worked through this one together, since it was our first measuring activity. I think Munchkin understood finding the numbers on the ruler, but perhaps not lining the paper up to the start of the ruler. It was a good introduction. Munchkin happens to be a dragon, so while these printables aren’t for the current year, she loved them! I’m struggling a little with where to go next for maths jobs. Munchkin can do quantity activities easily, but I’m not sure that she’s ready for proper addition problems yet. The odd and even activity from Every Star is Different actually seems like a great next step for her. I think these kinds of activities really show Montessori’s strengths. I see kids in the Montessori schools I go to be aware of these things, but it’s just not something mainstream education covers so early. At the end of the two week Chinese New Year celebration there is a lantern festival. Munchkin really wants to know when this year’s lantern festival is…so we made some lanterns! They are super easy to make: 1. Take a piece of paper and fold in half along the long edge. Cut slits from the folded ended to about an inch from the other side. 2. Cut a thin, long length from part of a second piece of paper. 3. Take the remainder of the second piece of paper and roll into the tallest tube you can make, tape. 4. Unfold the first piece of paper and wrap around the tube and tape. 5. Attach the thin strip you cut as a handle. Red and gold glitter glue on red paper provided this art prompt. I have two phonics boxes – each with about half of the alphabet. We worked with the second box this week. Once, we dumped the whole box out and sorted everything back into place, we also played “i-spy” using beginning sounds. Munchkin really does know all her phonics sounds, so I will be looking to see what we need to do next. We have a peach tree at our house, and it’s had beautiful pink blossoms for the past week or two. I found a cherry blossom branch printable and we used a mini soda bottle to make blossoms. We also worked on colour theory, since we have red and white paint, but not pink. Hi! This Jae of Pinay Homeschooler. 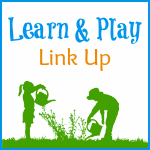 I love your work here and featured your post in our Learn & Play Link Up this week. Thank you for sharing and hope you join us again.